This an honest and brave post from a very talented writer. I like writing but I am hesitant about sharing. Self-doubt, apprehension, and fear continuously rear their putrid heads over and over again. The self-doubt and apprehension lead me to write. In part, I believe that this is an oxymoron because the fear and apprehension should make me run from the craft. The exploration of my language leaves me at a loss sometimes. I am lost in my thoughts and words— constantly. I am lost in observation and I am lost in the wonderment of exploration. I can explore the darkest thoughts of my mind and create something truly unique or I can create a poem that embraces every romantic idea I have ever come across and yet somehow, I feel it’s never good enough. It’s not good enough so it’s not worth sharing. I have so many creations, characters, and plots that are begging for exposure. When I visit with the grandchildren, a beloved ritual is reading a story before bedtime. The musicality of words floating into the ear and going into the mind becomes an arrow that pierces the heart. It always happens that way. This Thanksgiving I brought along plenty of books to read aloud. I also brought a new book to read. Not a read-aloud for the children, but a book for me. I never expected what would happen next. The children were camping out and snuggled in sleeping bags in the bedroom. It was fun, but didn’t lend itself to seeing the pictures in a picture book. 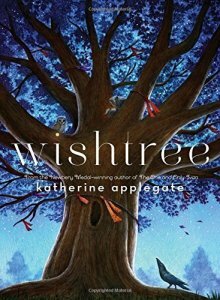 I thought I would read to them a little of my book, Wishtree by Katherine Applegate (the author of the award-winning book The One and Only Ivan). I hadn’t read the book, so we were all jumping into something new. One of the most extraordinary books I have ever read is The Things They Carried by Tim O’Brien. The book itself presents an interesting question: is this a novel or a collection of interrelated short stories? I do not intend to delve into that conundrum now, but it is something we often explore when I use this book in literature classes. O’ Brien, Tim. The Things They Carried. Broadway Books. New York. 1990.